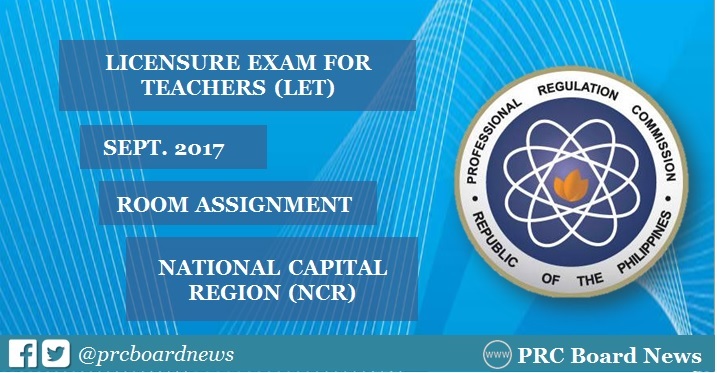 The Professional Regulation Commission (PRC) central office announces complete list of room assignment for takers of September 24, 2017 (Sunday) Licensure Exam for Teachers (LET) in the National Capital Region (NCR) or Manila. Room and school assignment for elementary and secondary levels for Manila (Agriculture and Fishery Arts, Biological Science, English, Filipino, MAPEH, Math, Physical Science, Social Studies, TLE and Values Education) were released on Tuesday. The September 2017 LET board exam will be held simultaneously in the following test centers: Baguio, Laoag, Rosales, Bacolod, Cagayan de Oro, Catarman (Northern Samar), Cebu, Davao, General Santos, Iloilo, Legaspi, Lucena, Manila, Rosales (Pangasinan), Tacloban, Tuguegarao, Pagadian, Zamboanga, Boac ( Marinduque), Calapan City (Oriental Mindoro), Kidapawan (Cotabato), Mamburao (Occidental), Mindoro, Masbate, Odiongan (Romblon), Puerto Princesa City (Palawaan), Virac (Catanduanes), Hong Kong and Bangkok (Thailand). PRC Board News will also update this website for the results of September 2017 LET. Bookmark this page or visit the website more often for more announcements.